, an illustrious English wit, and justly celebrated also for his political knowledge, was descended from a very ancient family, and born Nov. 30, 1667. His grandfather, Mr. Thomas Swift, was vicar of Goodrich in Herefordshire, and married Mrs. Elizabeth Dryden, aunt of Dryden the poet; by whom he had six sons, Godwin, Thomas, Dryden, William, Jonathan, and Adam. Thomas was bred at Oxford, but died young; Godwin was a barrister of Gray’s-inn; and William, Dryden, Jonathan, and Adam, were attornies. Godwin having married a relation of the old marchioness of Ormond, the old duke of Ormond made him attorney-general in the palatinate of Tipperary in Ireland. Ireland was at this time almost without lawyers, the rebellion having converted men of all conditions into soldiers. Godwin, therefore, determined to attempt the acquisition of a fortune in that kingdom, and the same motive induced his four brothers tO’go with him. Jonathan, at the age of about twenty-three, and before he went to Ireland, married Mrs. Abigail Erick, a gentlewoman of Leicestershire; and about two years after left her a widow with one child, a daughter, and pregnant with another, having no means of subsistence but an annuity of 20l. which her husband had purchased for her in England, immediately after his marriage. In this distress she was taken into the family of Godwin, her husband’s eldest brother; and there, about seven months after his death, delivered of a son, whom she called Jonathan, in remembrance of his father, and who was afterwards the celebrated dean of St. Patrick’s. It happened, by whatever accident, that Jonathan was | not suckled by his mother, but by a nurse, who was a native of Whitehaven and when he was about a year old, her affection for him was become so strong, that, finding it necessary to visit a sick relation there, she carried him with her, without the knowledge of his mother or uncle. At this place he continued about three years; for, when the matter was discovered, his mother sent orders not to hazard a second voyage, till he should be better able to benr it. Mrs. 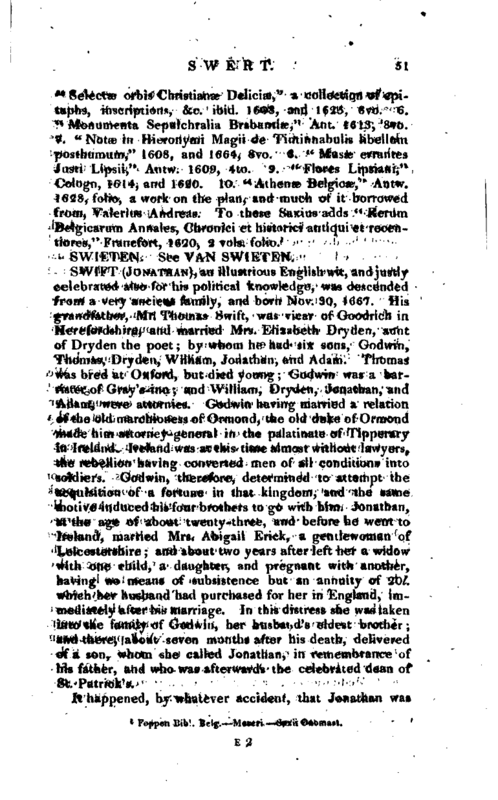 Swift, about two years after her husband’s death, quitted the family of Mr. Godwin Swift in Ireland, and retired to Leicester, the place of her nativity; but her son was again carried to Ireland by his nurse, and replaced under the protection of his uncle Godwin. 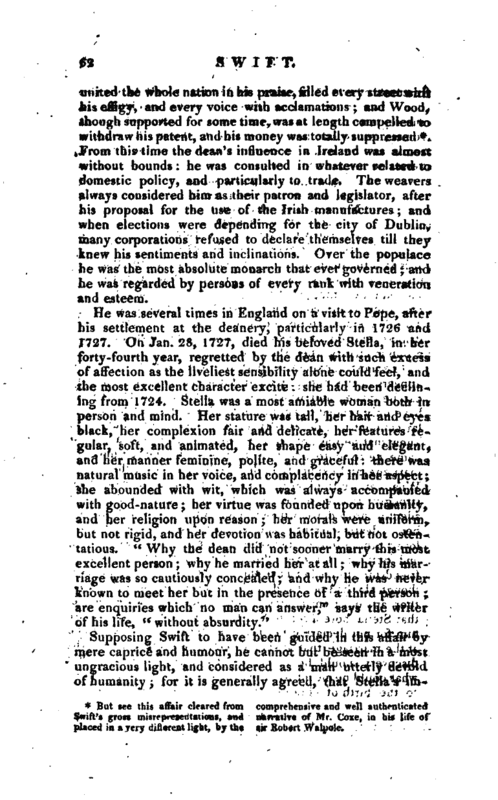 It has been generally believed, that Swift was born in England; and, when the people of Ireland displeased him, he has been heard to say, “I am not of this vile country; I am an Englishman:” but this account of his birth is taken from one which he left behind him, in his own hand-writing* Some have also thought, that he was a natural son of sir William Temple, because sir William expressed a particular regard for him; but that was impossible; for sir WilJiam was resident abroad in a public character from 1665 to 1670; and his mother, who was never out of the British dominions, brought him into the world in 1667. 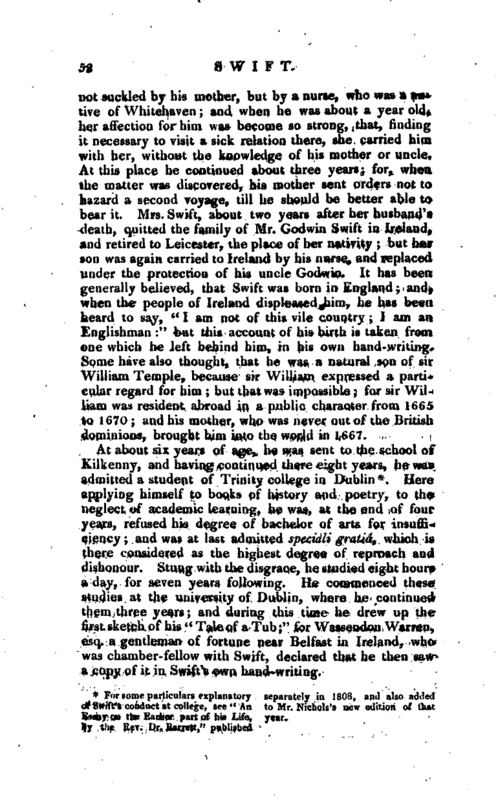 At about six years of age, he was sent to the school of Kilkenny, and having continued there eight years, he was admitted a student of Trinity college in Dublin*. 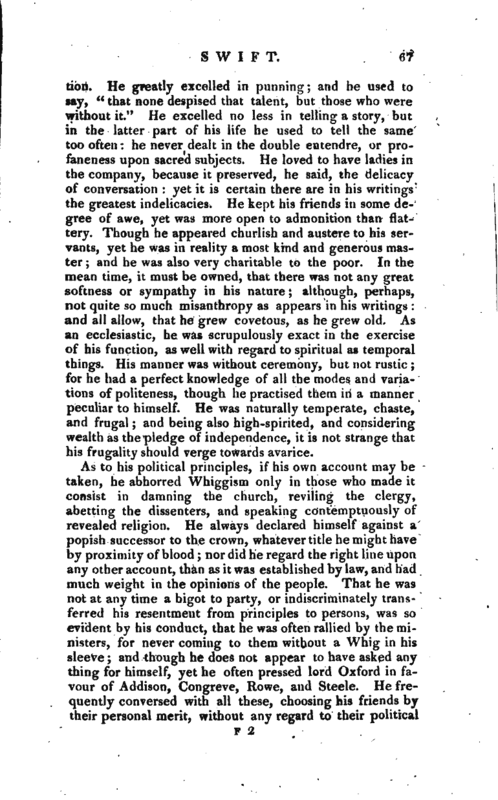 Here applying himself to books of history and poetry, to the neglect of academic learning, he was, at the end of four years, refused his degree of bachelor of arts for insufficiency; and was at last admitted speciali gratia, which is there considered as the highest degree of reproach and dishonour. Stung with the disgrace, he studied eight hours a day, for seven years following. He commenced these studies at the university of Dublin, where he continued them three years; and during this time he drew up the first sketch of his “Tale of a Tub;” for Wassendon Warren, esq. a gentleman of fortune near Belfast in Ireland, wha was chamber- fellow with Swift, declared that he then saw a copy of it in Swift’s own hand-writing. 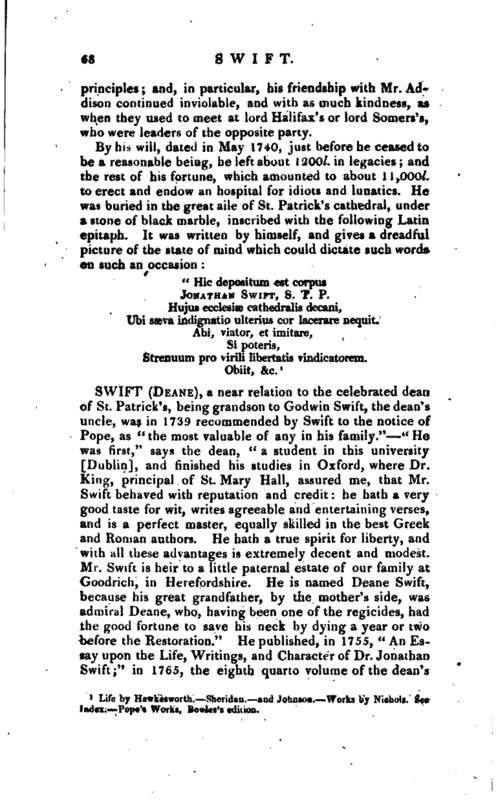 For some particulars explanatory of Swift’s conduct at college, see “An Esay on the Earlier part of his Life, by the Rev. 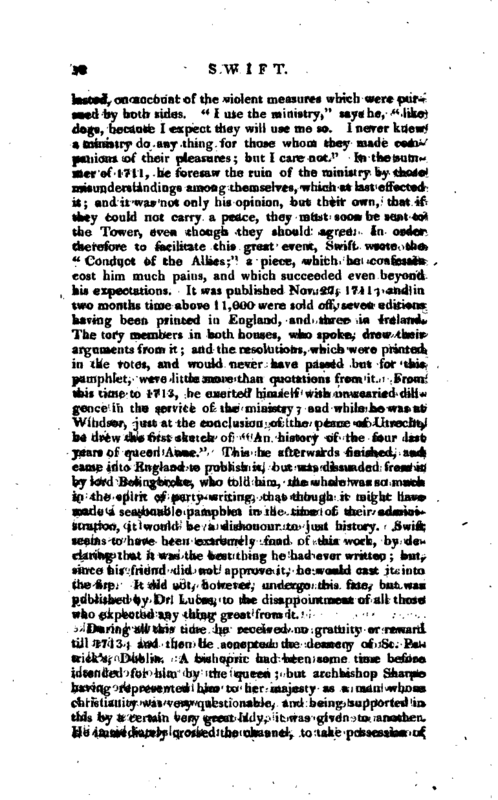 Dr. Barrett,” published separately in 1803, and also added to Mr. Nichols’s new edition of that year. | In 1688, his uncle Godwin was seized with a lethargy, and soon after was deprived both of his speech and memory: by which accident Swift being left without support, took a journey to Leicester, that he might consult with his mother what course of life to pursue. At this time sir William Temple was in high reputation, and honoured with the confidence and familiarity of king William. His father sir John Temple, had been master of the Rolls in Ireland, and contracted an intimate friendship with Godwin Swift, which continued till his death; and sir William, who inherited his title and estate, had married a lady to whom Mrs. Swift was related: she therefore advised her son to communicate his situation to sir William, and solicit his direction what to do. Sir William received him with great kindness, and Swift’s first visit continued two years. Sir William had been ambassador and mediator of a general peace at Nimeguen before the Revolution; in which character he became known to the prince of Orange, who frequently visited him at Sheen, after his arrival in England, and took his advice in affairs of the utmost importance. 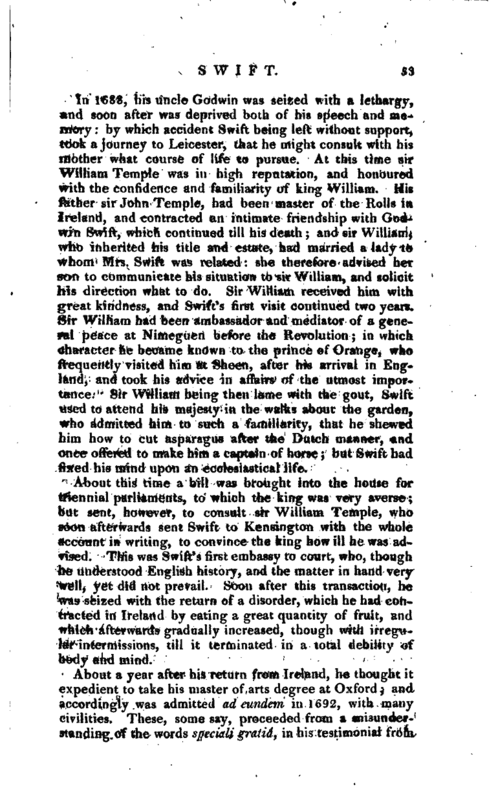 Sir William being then lame with the gout, Swift used to attend his majesty in the walks about the garden, who admitted him to such a familiarity, that he shewed him how to cut asparagus after the Dutch manner, and once offered to make him a captain of horse; but Swift had fixed his mind upon an ecclesiastical life. About this time a bill was brought into the house for triennial parliaments, to which the king was very averse; but sent, however, to consult sir William Temple, who soon afterwards sent Swift to Kensington with the whole account in writing, to convince the king how ill he was advised. This was Swift’s first embassy to court, who, though he understood English history, and the matter in hand very well, yet did not prevail. Soon after this transaction, he was seized with the return of a disorder, which he had contracted in Ireland by eating a great quantity of fruit, and which afterwards gradually increased, though with irregular intermissions, till it terminated in a total debility of body and mind. About a year after his return from Ireland, he thought it expedient to take his master of arts degree at Oxford; and accordingly was admitted ad eundem in 1692, with many civilities. These, some say, proceeded from a misunderstanding of the words speciali gratia, in his testimonial from | Dublin, which was thcr supposed to be a compliment paid to uncommon merit; but are more probably ascribed by others to his known connection with sir William Temple. It is easy to conceive, however, that Swift, after his reputation was established, might, while he was sporting with this incident in the gaiety of his heart, pretend a mistake which never happened. 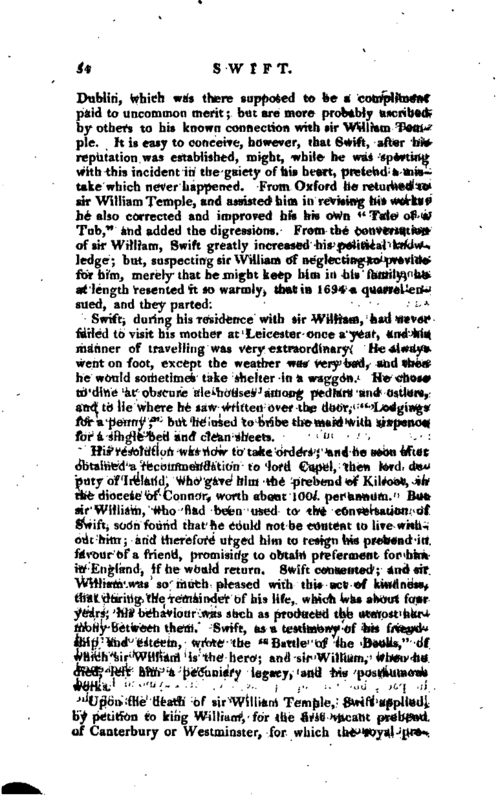 From Oxford he returned to sir William Temple, and assisted him in revising his works: he also corrected and improved his his own “Tale of a Tub,” and added the digressions. From the conversation of sir William, Swift greatly increased his political knowledge; but, suspecting sir William of neglecting to provide for him, merely that he might keep him in his family, he at length resented it so warmly, that in 1694 a quarrel ensued, and they parted. Swift, during his residence with sir William, had never failed to visit his mother at Leicester once a year, and his manner of travelling was very extraordinary. He always went on foot, except the weather was very bad, and then he would sometimes take shelter in a waggon. He chose to dine at obscure ale-houses among pedlars and ostlers, and to lie where he saw written over the door, “Lodgings for a penny” but he used to bribe the maid with sixpence for a single bed and clean sheets. His resolution was now to take orders; and he soon after obtained a recommendation to lord Capel, then lord deputy of Ireland, who gave him the prebend of Kilroot, in the diocese of Connor, worth about 100l. per annum. But sir William, who had been used to the conversation of Swift, soon found that he could not be content to live without him; and therefore urged him to resign his prebend in favour of a friend, promising to obtain preferment for him in England, if he would return. Swift consented; and sir William was so much pleased with this act of kindness, that during the remainder of his life, which was about four years, his behaviour was such as produced the utmost harmony between them. Swift, as a testimony of his friendship and esteem, wrote the “Buttle of the Books,” of which sir William is the hero; and sir William, when he died, left him a pecuniary legacy, and his posthumous works. Upon the death of sir William Temple, Swift applied, by petition to king William, for the- first vacant prebend of Canterbury or Westminster, for which the royal | promise had been obtained by his late patron, whose posthumous works he dedicated to his majesty, to facilitate the success of that application. But it does not appear, that, after the death of sir William, the king took the least notice of Swift. After this he accepted an invitation from the earl of Berkeley, appointed one of the lords justices of Ireland, to attend him as chaplain and private secretary; but he was soon removed from this post, upon a pretence that it svas not fit for a clergyman. This disappointment was presently followed by another; for when the deanery of Derry became vacant, and it was the earl of Berkeley’s turn to dispose of it, Swift, instead of receiving it as an atonement for his late usage, was put off with the livings of Laracor and Rathbeggin, in the diocese of Meath, which together did not amount to half its value. He went to reside at Laracor, and performed the duties of a parish priest with the utmost punctuality and devotion. He was, indeed, always very devout, not only in his public and solemn addresses to God, but in his domestic and private exercises i and yet, with all this piety in his heart, he could not forbear indulging the peculiarity of his humour, when an opportunity offered, whatever might be the impropriety of the time and place. Upon his coming to Laracor, he gave public notice, that he would read prayers on Wednesdays and Fridays, which had not been the cus-> torn; and accordingly the bell was rung, and he ascended the desk. But, having remained some time with no other auditor than his clerk Roger, he began, “Dearly beloved Roger, the Scripture moveth you and me in sundry places;” and so proceeded to the end of the service. Of the same kind was his race with Dr. Raymond, vicar of Trim, soon after he was made dean of St. Patrick’s. Swift had dined one Sunday with Raymond, and when the bells had done ringing for evening prayers, “Raymond,” says Swift, “I will lay you a crown, that I begin prayers before you this afternoon.” Dr. Raymond accepted the wager, and immediately both ran as fast as they could to the church. Raymond, the nimbler of the two, arrived first at the door, and when he entered the church, walked decently towards the reading-desk: Swift never slackened his pace, but running up the aite, left Raymond behind him, and stepping into the desk, without putting on the surplice, or opening the book, began the service in an audible voice, | During Swift’s residence at Laracor, he invited to Ireland a lady whom he has celebrated by the name of Stella. With this lady he became acquainted while he lived with sir William Temple: she was the daughter of his steward, whose name was Johnson; and sir William, when he died, left her 1000l. in consideration of her father’s faithful services. At the death of sir William, which happened in 1699, she was in the sixteenth year of her age; and it was about two years afterwards, that at Swift’s invitation she Jeft England, accompanied by Mrs. Dingley, a lady who was fifteen years older, and whose whole fortune, though she was related to sir William, was no more than an annuity of 27l. Whether Swift at this time desired the company of Stella as a wife, or a friend, it is not certain: but the reason which she and her companion then gave for their leaving England was, that in Ireland the interest of money was higher, and provisions were cheap. 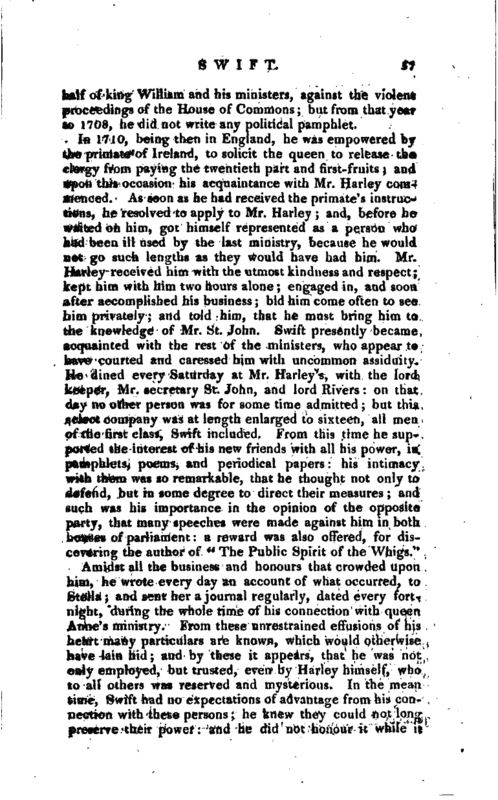 But, whatever was Swift’s attachment to Miss Johnson, every possible precaution was taken to prevent scandal: they never lived in the same house; when Swift was absent, Miss Johnson and her friend resided at the parsonage; when he returned, they removed either to his friend Dr. Raymond’s, or to a lodging; neither were they ever known to meet but in the presence of a third person. 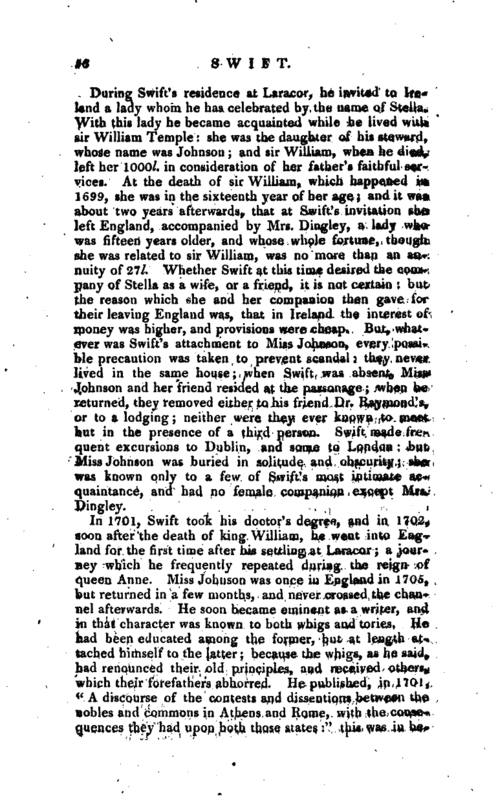 Swift made frequent excursions to Dublin, and some to London: but Miss Johnson was buried in solitude and obscurity; she was known only to a few of Swift’s most intimate acquaintance, and had no female companion except Mrs. Dingley. In 1701, Swift took his doctor’s degree, and in 1702, soon after the death of king William, he went into England for the first time after his settling at Laracor; a journey which he frequently repeated during the reign of queen Anne. Miss Johnson was once in England in 1705, but returned in a few months, and never crossed the channel afterwards. He soon became eminent as a writer, and in that character was known to both whigs and tories. He had been educated among the former, but at length attached himself to the latter; because the whigs, as he said, bad renounced their old principles, and received others, which their forefathers abhorred. He published, in 1701, “A discourse of the contests and dissentions between the nobles and commons in Athens and Home, with the consequences they had upon both those states” this was in | behalf of king William and his ministers, against the violent proceedings of the House of Commons; but from that year to 1708, he did not write any political pamphlet. Amidst all the business and honours that crowded upon him, he wrote every day an account of what occurred, to Stella; and sent her a journal regularly, dated every fort* night, during the whole time of his connection with queen Anne’s ministry. From these unrestrained effusions of -his heart many particulars are known, which would otherwise have lain hid; and by these it appears, that he was not only employed, but trusted, even by Hariey himself, who to all others was reserved and mysterious. In the mean time, Swift had no expectations of advantage from his con* nection with these persons; he knew they could not long preserve their power: and he did not honour it while it | lasted, on account of the violent measures which were pursued by both sides. “I use the ministry,‘ 1 says he,” like dogs, because I expect they will use me so. I never knew a ministry do anything for those whom they made companions of their pleasures; but I care not.“In the summer of 1711, he foresaw the ruin of the ministry by those misunderstandings among themselves, which at last effected it; and it was not only his opinion, but their own, that if they could not carry a peace, they must soon be sent to the Tower, even though they should agree. In order therefore to facilitate this great event, Swift wrote the” Conduct of the Allies;“a piece, which he confesses cost him much pains, and which succeeded even beyond his expectations. It was published Nov. 27, 1711; and in two months time above 11,000 were sold off, seven editions having been printed in England, and three in Ireland. The tory members in both houses, who spoke, drew their arguments from it; and the resolutions, which were printed in the votes, and would never have passed but for this pamphlet, were little more than quotations from it. From this time to 1713, he exerted himself with unwearied diligence in the service of the ministry; and while he was at Windsor, just at the conclusion of the peace of Utrecht, he drew the first sketch of” An history of the four last years of queen Anne." This he afterwards finished, and came into England to publish it, but was dissuaded from it by lord Bolingbroke, who told him, the whole was so much in the spirit of party-writing, that though it might have made a seasonable pamphlet in the time of their administration, it. would be a dishonour to just history. Swift seems to have been extremely fond of this work, by declaring that it was the best thing he had ever written; but, since his friend did not approve it, he would cast it into the fire. It did not, however, undergo this fate, but was published by Dr. Lucas, to the disappointment of all those who expected any thing great from it. During all this time he received no gratuity or reward till 1713; and then he accepted the deanery of St. Patrick’s, Dublin. A bishopric had been some “time before intended for him by the queen; but archbishop Sharpe having represented him to her majesty as a man whose Christianity was very questionable, and being supported in this by a certain very great lady, it was given to another. He immediately crossed the channel, to take possession of | his new dignity but did not stay in Ireland more than a fortnight, being urged by an hundred letters to hasten back, and reconcile the lords Oxford and Bolingbroke. When he returned, he found their animosity increased; and, having predicted their ruin from this very cause, he laboured to bring about a reconciliation, as that upon which the whole interest of their party depended. Havin<* attempted this by various methods in vain, he went to a friend’s house in Berkshire, where he continued till the queen’s death; and, while he was at this place, wrote a discourse called” Free thoughts on the present state of affairs," which, however, was not published till some time after. Before we attend Swift to Ireland, it is necessary to give a little history of his Vanessa, because his connections with her were made in England. Among other persons with whom he was intimately acquainted during the gay part of his life, was Mrs. Vanhomrigh. She was a lady of good family in Ireland, and became the wife of Mr. Vanhomrigh, first a merchant of Amsterdam, then of Dublin, where he was raised by king William, upon his expedition into Ireland, to very great places. Dying in 1703, he left two sons and two daughters; but the sons soon after dying, his whole fortune, which was considerable, fell to the daughters. In 1709, the widow and the two young ladies came to England, where they were visited by persons of the first quality; and Swift, lodging near them, used to be much there, coming and going without any ceremony, as if he had been one of the family. During this familiarity, he became insensibly a kind of preceptor to the young ladies, particularly the eldest, who was then about twenty years old, was much addicted to reading, and a great admirer of poetry. Hence admiring, as was natural, such a character as that of Swift, she soon passed from admiration to love; and, urged a little perhaps by vanity, which would have been highly gratified by an alliance with the first wit of the age, she ventured to make the doctor a proposal of marriage. He affected at fust to believe her ’in jest, then to rally her on so whimsical a choice, and at last to put her off without absolute refusal; and, while he was in this situation, he wrote the poem called “Cadenus and Vanessa.” It was written in 1713, a short time before he left Vanessa and the rest of his friends in England, and returned to the place of his exile, | as he used frequently to call it. 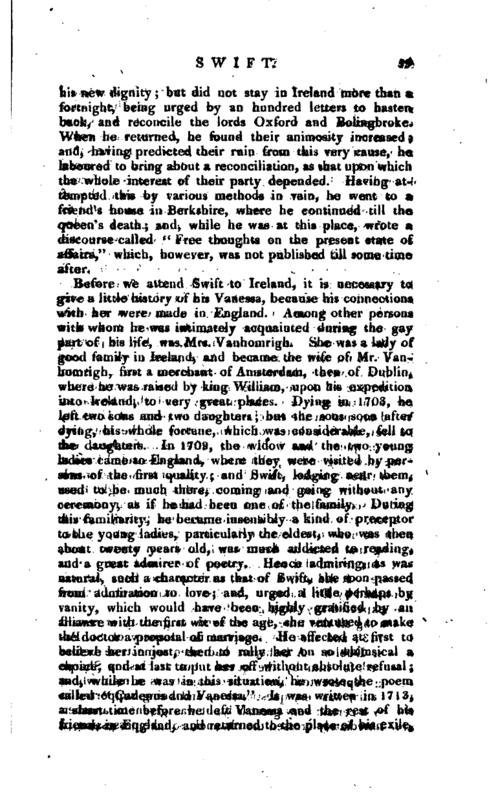 In 1714, Mrs. Vanhomrigh died and, having lived very expensively, left some debts, which it not being convenient for her daughters, who had also debts of their own, to pay at present, to avoid an arrest they followed the dean into Ireland. The first remarkable event of his life, after his settlement at the deanery, was his marriage to Mrs. Johnson, after a most intimate friendship of more than sixteen years. This was in 1716; and the ceremony was performed by Dr. Ashe, then bishop of Clogher, to whom the dean had been a pupil in Trinity college, Dublin. But, whatever were the motives to this marriage, the dean and the lady continued to live afterwards just in the same manner as they had lived before. Mrs. Dingley was still the inseparable companion of Stella wherever she went; and she never resided at the deanery, except when the dean had his fits of giddiness and deafness. Till this time he had continued his visits to Vanessa, who preserved her reputation and friends, and was visited by many persons of rank, character, and fortune, of both sexes but now his visits were less | frequent. In 1717 her sister died; and the whole remains of the family fortune centering in Vanessa, she retired to Selbridge, a small house and estate about twelve miles from -Dublin, which had been purchased by her father. From this place she wrote frequently to the dean; and he answered her letters: she pressed him to marry her, but he rallied, and still avoided a positive denial. She pressed him still more, either to accept or refuse her as a wife; upon which he wrote an answer, and delivered it with his own hand. 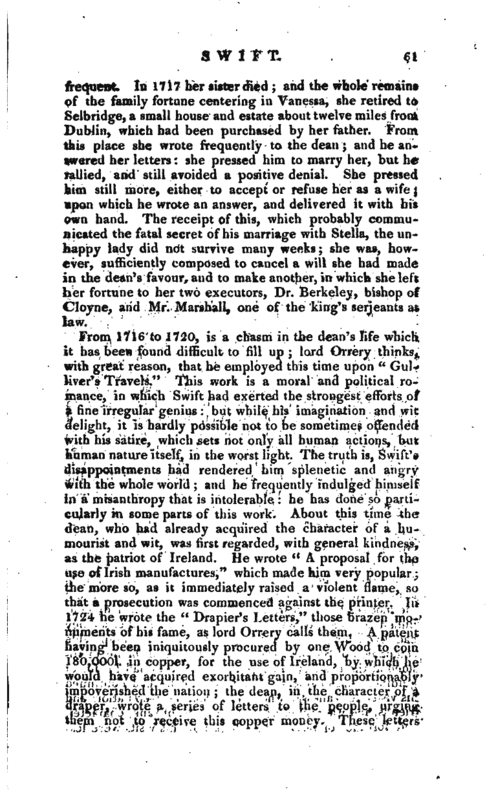 The receipt of this, which probably communicated the fatal secret of his marriage with Stella, the unhappy lady did not survive many weeks; she was, however, sufficiently composed to cancel a will she had made in the dean’s favour, and to make another, in which she left her fortune to her two executors, Dr. Berkeley, bishop of Cloyne, and Mr. Marshall, one of the king’s Serjeants at law. But see this affair cleared from Swift’s gross misrepresentations, and placed in a very different light, by the comprehensive and well authenticated narrative of Mr. Coxe, in his life of sir Robert Walpole. 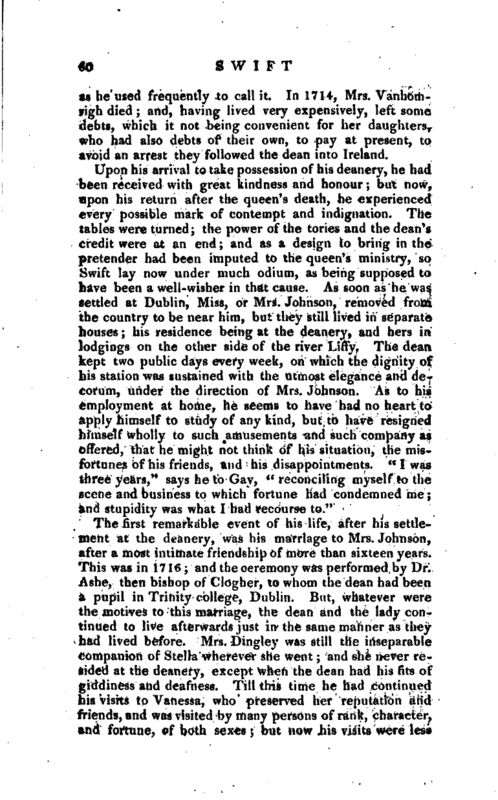 Prom this time the dean’s influence in Ireland was almost without bounds: he was consulted in whatever related to domestic policy, and particularly to tra/le. The weavers always considered him as their patron and legislator, after his proposal for the use of the Irish manufactures; and when elections were depending for the city of Dublin, many corporations refused to declare themselves till they knew his sentiments and inclinations. Over the populace he was the most absolute monarch that ever governed; and he was regarded by persons of every rank with veneration and esteem. Who gladly would your sufferings share." It is said the dean did at length earnestly desire, that she might be publicly owned as his wife; but, as her health, was then declining, she said, “it is too late,” and insisted, that they should continue to live as they had lived before. To this the dean in his turn consented, and suffered her to dispose entirely of her own fortune, by her own name, to a public charity when she died. One attributes his singular conduct to a peculiarity in his constitution; but, if he knew that he was unfit to enter into the married state, how came he to unite one lady to himself by the ceremony of marriage, and explicitly to declare his passion to the other? What can we think also of the sensibility of a man, who, strongly attached as he seems to have been to both, could silently throw down a paper before the one, which proved her “death-warrant,” and could throw the other (his beloved Stella) into unspeakable agonies, in her last illness, and quit her for ever, “only for adjuring him, by their friendship, to let her have the satisfaction of dying at least, though she had not lived, his acknowledged wife.” Another apologist insinuates, upon something like evidence, that Stella bore a son to Swift, and yet labours to excuse him for not declaring her his wife, because she had agreed at the marriage that it should remain a secret, unless the discovery should be demanded by urgent necessity. But what could be meant by urgent necessity, unless it alluded to the birth of children, he confesses it would be hard to | say. The truth is, probably, what has been saicl by Dr*, Johnson, that the man whom Stella had the misfortune ttf love, was fond of singularity, and desirous to make a mode of happiness for himself, different from the general course of things, and the order of Providence. He wished for all the pleasures of perfect friendship, without the uneasiness of conjugal restraint. But with this state poor Stella was not satisfied; she was never treated as a wife, and to the world she had the appearance of a mistress. She lived sullenly on, hoping that in time he would own and receive her. This, as we have seen, he did at last offer to do but not till the change of his manners, and the depravation of his mind, made her tell him that it was too late. Scholars have long remarked a gross error In quantity, in this first word; the second syllable of it being long. inops, surdus, male gratus amicis. To all my friends a burden grown." 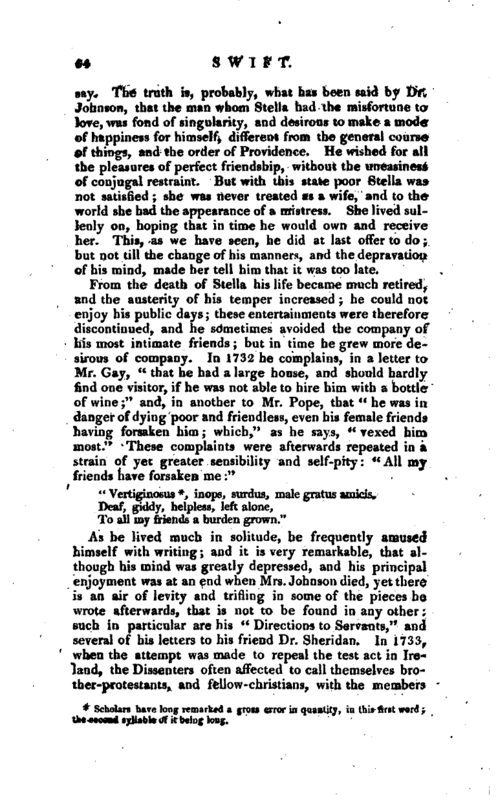 As he lived much in solitude, he frequently amused himself with writing; and it is very remarkable, that although his mind was greatly depressed, and his principal enjoyment was at an end when Mrs. Johnson died, yet there is aji air of levity and trifling in some of the pieces he wrote afterwards, that is not to be found in any other: such in particular are his “Directions to Servants,” and several of his letters to his friend Dr. Sheridan. In 1733, when the attempt was made to repeal the test act in Ireland, the Dissenters often affected to call themselves brother-protestants, and fellow-christians, with the members | of the established church. 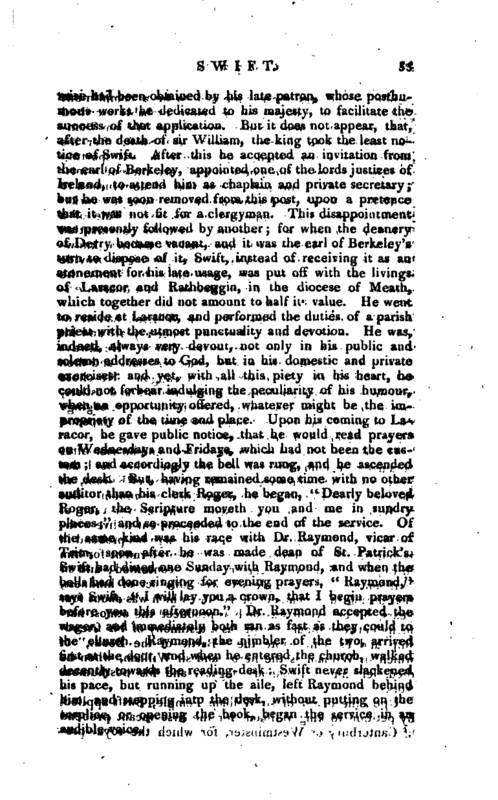 Upon this occasion the dean wrote a short copy of verses, which so provoked one Bettesworth, a lawyer, and member of the Irish parliament, that he swore, in the hearing of many persons, to revenge himself either by murdering or maiming the author; and, for this purpose, he engaged his footman, with two ruffians, to secure the dean wherever he could be found. This being known, thirty of the nobility and gentry within the liberty of St. Patrick’s waited upon the dean in form, and presented a paper subscribed with their names, in which they solemnly engaged, in behalf of themselves and the rest of the liberty, to defend his person and fortune, as the friend and benefactor of his country. When this paper was delivered, Swift was in bed, deaf and giddy, yet made a shift to dictate a proper answer. 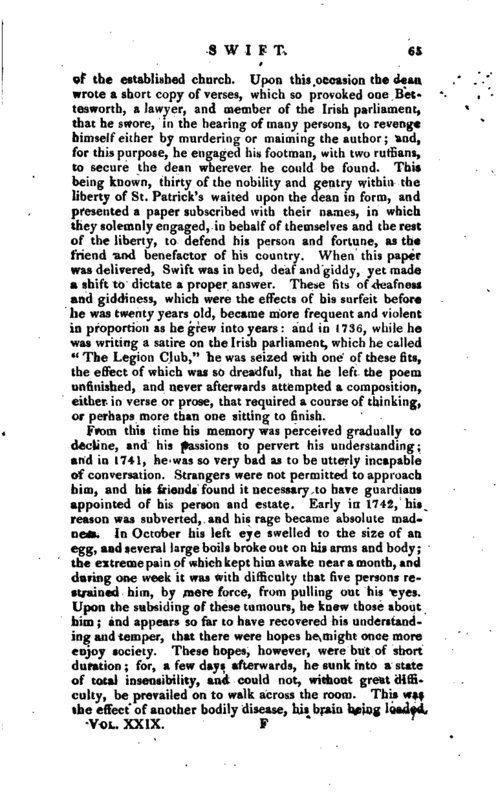 These fits of deafness and giddiness, which were the effects of his surfeit before he was twenty years old, became more frequent and violent in proportion as he grew into years: and in 1736, while he was writing a satire on the Irish parliament, which he called “The Legion Club,” he was seized with one of these fits, the effect of which was so dreadful, that he left the poem unfinished, and never afterwards attempted a composition, either in verse or prose, that required a course of thinking, or perhaps more than one sitting to finish. From this time his memory was perceived gradually to decline, and his passions to pervert his understanding; and in 1741, he was so very bad as to be utterly incapable of conversation. Strangers were not permitted to approach him, and his friends found it necessary to have guardians appointed of his person and estate. Early in 1742, his reason was subverted, and his rage became absolute madness. In October his left eye swelled to the size of an egg, and several large boils broke out on his arms and body; the extreme pain of which kept him awake near a month, and during one week it was with difficulty that five persons restrained him, by mere force, from pulling out his eyes. Upon the subsiding of these tumours, he knew those about him; and appears so far to have recovered his understanding and temper, that there were hopes he might once more enjoy society. These hopes, however, were but of short duration; for, a few days afterwards, he sunk into a state of total insensibility, and could not, without great difficulty, be prevailed on to walk across the room. This was the effect of another bodily disease, his brain being loaded | with water. Mr. Stevens, an ingenious clergyman lin, pronounced this to be the case during his illness; and, upon opening his body, it appeared that he was not mistaken. After the dean had continued silent a whole year in this state of helpless idiotism, his housekeeper went into his room on the 30th of November in the morning, and told him, “it was his birth-day, and that bonfires and illuminations were preparing to celebrate it as usual:” to which he immediately replied, “It is all folly; they had better let it alone.” Some other instances of short intervals of sensibility and reason, after his madness ended in stupor, seem to prove, that his disorder, whatever it was, had not destroyed, but only suspended, the powers of his mind. In 1744, he now and then called his servant by name; and once attempting to speak to him, but not being able to express his meaning, he shewed signs of much uneasiness, and at last said, “I am a fool.” Once afterwards, as his servant was taking away his watch, he said, “Bring it here:” and when the same servant was breaking a large hard coal, he said, “That is a stone, you blockhead.” From this time he was perfectly silent till the latter end of October 1745, and then died, without the least pang or conYu4sion, in the seventy-eighth year of his age. His works have been printed often, and in various forms, and from them it is easy to collect his character. Of these the most elegant is in fourteen vols. 4to; a kind of variorum edition, of which eight were published by Dr. Hawkesworth, three by Deane Swift, esq. and three by Mr. Nichols. These have been reprinted in twenty-five volumes large 8vo; in twenty-seven volumes of a smaller 8vo \ and also in twenty-seven volumes 18mo. 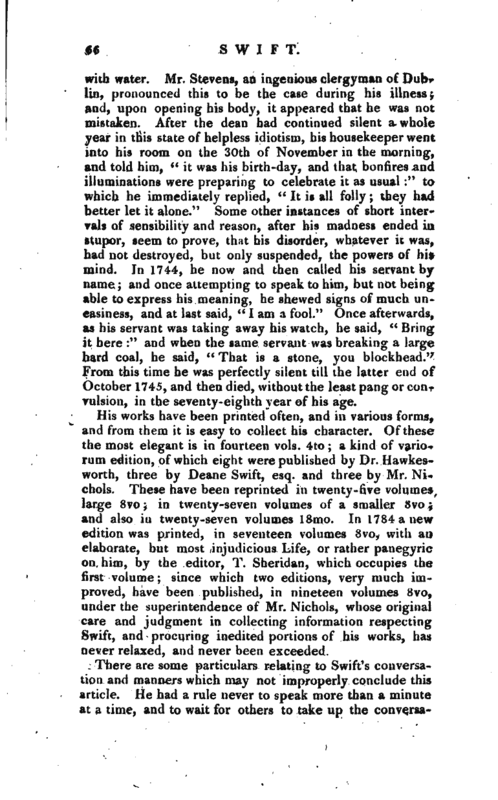 In 1784 a new edition was printed, in seventeen volumes 8vo, with an elaborate, but most injudicious Life, or rather panegyric on him, by the editor, T. Sheridan, which occupies the first volume; since which two editions, very much improved, have been published, in nineteen volumes 8vo, under the superintendence of Mr. Nichols, whose original care and judgment in collecting information respecting Swift, and procuring inedited portions of his works, has never relaxed, and never been exceeded. 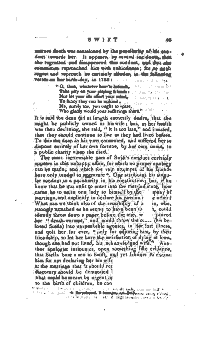 There are some particulars relating to Swift’s conversation and manners which may not improperly conclude thi article. He had a rule never to speak more than a minu at a time, and to wait for others to take up the | conversetion. He greatly excelled in punning and he used to say, “that none despised that talent, but those who were without it.” He excelled no less in telling a story, but in the latter part of his life he used to tell the same too often: he never dealt in the double entendre, or profaneness upon sacred subjects. He loved to have ladies in the company, because it preserved, he said, the delicacy of conversation: yet it is certain there are in his writings the greatest indelicacies. He kept his friends in some degree of awe, yet was more open to admonition than flattery. Though he appeared churlish and austere to his servants, yet he was in reality a most kind and generous master; and he was also very charitable to the poor. In the mean time, it must be owned, that there was not any great softness or sympathy in his nature; although, perhaps, not quite so much misanthropy as appears in his writings: and all allow, that he grew covetous, as he grew old. As an ecclesiastic, he was scrupulously exact in the exercise of his function, as well with regard to spiritual as temporal things. His manner was without ceremony, but not rustic; for he had a perfect knowledge of all the modes and variations of politeness, though he practised them in a manner peculiar to himself. He was naturally temperate, chaste, and frugal; and being also high-spirited, and considering wealth as the pledge of independence, it is not strange that his frugality should verge towards avarice. As to his political principles, if his own account may be taken, he abhorred Whiggisrn only in those who made it consist in damning the church, reviling the clergy, abetting the dissenters, and speaking contemptuously of revealed religion. He always declared himself against a popish successor to the crown, whatever title he might have by proximity of blood; nor did he regard the right line upon any other account, than as it was established by law, and had much weight in the opinions of the people. That he was not at any time a bigot to party, or indiscriminately transferred his resentment from principles to persons, was. so evident by his conduct, that he was often rallied by the ministers, for never coming to them without a Whig in his sleeve; and though he does not appear 'to have asked any thing for himself, yet he often pressed lord Oxford in favour of Addison, Congreve, Rowe, and Steele. He frequently conversed with all these, choosing his friends by their personal merit, without any regard to their political | principles; and, in particular, his friendship with Mr. Addison continued inviolable, and with as much kindness, as when they used to meet at lord Halifax’s or lord Somers’s, who were leaders of the opposite party. Jonathan Swift, S. T. P.
Strenuum pro virili libertatis vindicatorem. Life by Hawkesworth.—Sheridan. and Johnson.—Works by Nichols. See Index.—Pope’s Works, Bowles’s edition.